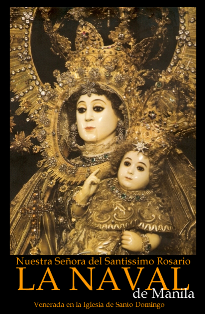 Of all the famous Marian images in the Philippines, La Naval stands alone as a "native virgin". Although her clothes mark her readily as a product of the 17th century Spanish "Golden Age", her oriental features reflect the uniqueness of her position as a truly indigenous queen of the Philippines. In 1593, on the death of his father, the Spanish Governor General Luis Perez Dasmarinas commissioned Captain Hernando de los Rios Coronel to have a Marian statue sculpted. He wished to give a religious imprint to his regime in the Philippines. A non-Catholic Chinese sculptor was found to make the statue. This sculptor later became a convert through the intercession of the virgin. The beautiful image was presented to the Manilla Dominicans and enshrined in the old Sto. Domingo Church by the Pasig. The image is about 4'8" tall and is made of hard-wood, with ivory face and hands. Over three centuries have mellowed the ivory to a delicate brown. The Oriental- Filipina face is almond-shaped, with high-set cheekbones and slanting eyes. The image is dressed as a royal lady of the palace of King Philip of Spain. On her left arm, she holds her beloved Holy Child Jesus. With her right arm, she holds a royal scepter and staff and her Rosary. The statue is covered with jewels, tributes from her throngs of devotees through the ages. Each jewel has its own story. The halo issurrounded by 24 stars, and she wears a queenly crown. In 1571, the armada of the Cross under John of Austria, brother of King Phillip II, met and defeated the naval armies of the Crescent under Selim the Sot off the gulf of Lepanto between Itally and Greece. Saint Pius V, the great Dominimcan Pope, ordered the public praying of the Rosary throughout Christendom in support of the Christian navies stopping the onslaught of Islam. Although aged and ill, he himself led, on foot, a rosary procession through Rome. After the victory fo the Christian forces, the church was quick to acknowledge the help of Our Lady, and instituted October 7 as the feast of the Queen of the Most HOly Rosary, a feast around which naval traditions have gravitated through the centuries. 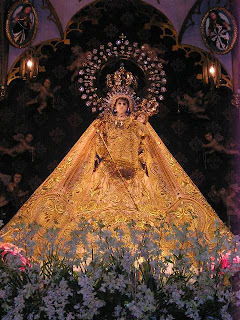 From this, the name "La Naval" came to be known as a special title for Our Lady, helper of Christian Navies. In the Philippines of 1646, there were not only hostile Muslims in the South, but also Dutch and English privateers who wanted the riches of the archipelago and who wanted to replace Catholicism with Dutch Protestant Calvinism. During this year, there were five bloody naval battles between the greatly outnumbered Spanish - Catholic - Phillipine forces and the Dutch marauders. Only fifteen of the defenders of Manilla were lost in all of the battles. The Dutch, then political enemies of the Spanish, retreated, and never again threatened to destroy the integrity of the islands by annexing them to the Dutch East Indies. Before each of the battles, the intercession of Our Lady was fervently sought. Crew members -- Spanish soldiers, religious, and Filipinos -- vowed special homage to Our Lady for a victorious battle. True to their Latin heritage and Catholic pride, the victorious defenders petitioned official church recognition and declaration of the naval victories of 1646 as miracles worked by the Mother of God. The Ecclesiastical Council in Cavite, with the help of doctors of theology, canonical experts, and prominent religious, deliberated and examined written and oral testimonies from all eye-witnesses. Finally, on April 9, 1662, the Council ordered that the five naval victories of 1646 be declared as miraculous, "granted by the Sovereign Lord through the intercession of the Most Holy Virgin and devotion to her Rosary, that the miracles be celebrated, preached and held in festivities and to be recounted among the miracles wrought by the Lady of the Rosary for the greater devotion of the faithful to Our Most Blessed Virgin Mary and Her Holy Rosary." This decree was signed by all eight members of the Church Council. As ordered, these miracles have been preached and celebrated in solemn festivities for over three centuries. Through the centuries, there have been a number of political upheavals in Catholic Phillipines. Still, the people have retained the tradition of celebration of La Naval de Manila. After the 1896 Revolution, the large processions in her honor were toned down, but never suspended. In 1906, La Naval was crownded canonically by Rome's Apostolic Legate. In l941, her shrine in the old Sto. Domingo Church in Manilla was bombed. La Naval was safely hidden for a time in the old church's vault, and later transferred to the chapel of the University of Sto. Tomas. Here, thousands of her devotees flocked to honor her in her third Centennial in l946. In l952, the cornerstone was laid for a new shrine at the Sto. Domingo Church in Quezon City. In l954, in a boat shaped carriage, La Naval was led in solemn procession by the Phillippines hierarchy, public officials, priests, nuns, and thousands of devotees to her new home. This shirne was declared by the Philippine bishops as the national shrine of the Queen of the Holy Rosary of the Philippines. During her feast in October of 1973, La Naval was acknowledged as the patroness of the capitol city of the Philippines. In l974, she was enshrined in a safer vault- altar because of recent sacrilegious robberies of churches and sacred images in the area. In l985, a year long celebration was held in the Philippines for the Marian year. Shortly thereafter, in February of l986, Cardinal Jaime Sin, archbishop of Manilla, called for "people power" in a pastoral act designed to avoid bloodshed. The phenomenon surfaced, and people armed only with the weapons of love ---rosaries, icons of Jesus and Mary, flowers and food --were able to stop tanks and troops in battle gear. Rosary vigils and nightly processions of a replica of the antique image of La Naval were led by the Filipino Dominicans outside the gates of the Presidential palace. Many Filipinos attribute the victory in the peaceful revolution to divine intervention. Two of the most prominent church leaders in the Philippines, Cardinal Sin and Cardina Ricardo Vidal, archbishop of Cebu, have said they see the church's role in the Philippines in traditional terms of nonviolence and prevention of bloodshed. They encourage their people to work together for peace. The Dominicans and the devotees of La Naval implore their special patroness here to bring them this fervently sought for peace. I am so greatly thankful that you have found the blog interesting and celebrate Our Lady of the Holy Rosary. I'm sorry for the slow response to queries and comments but I will get to them as soon as time permits. I thank all the wonderful people who allow their photos and artwork to be shown in this blog. I'm Sure La Gran Señora de Las Islas Filipinas is smiling down upon you. This is not an official site of the Dominican Fathers of the Philippines. This is a personal site by a La Naval Devotee. Articles and images are credited to their original authors/owners and are published with permission. Please do not republish or use them in any way without the permission of the original owners. Please respect intellectual property rights.